A few months ago photos of a new highlighter from Guerlain hit social media. The word was that it would only be released in Japan and Dubai. There could also be some pieces sent to some retailers in Asia. While all the speculations going on about where and how it will appear, I asked dear Stacey , who lives in Dubai, to keep an eye on it. She told me she feels like a magical make-up finding fairy but it would be an understatement! She was more like a hawk who was landing on our prey the moment she saw it. Needless to say, she didn't give it any chance for it to escape. The packaging is very light and made of plastic with a twist lid. It is certainly not the most luxurious feeling one out there but I find it to be very practical. When I apply make-up, the lid keeps on falling which is not the case here. The very lightweight is great if you are travelling but honestly I wouldn't travel anywhere with very exclusive items. If hijackers take over the plane, I might end up loosing my precious products which would kill me even if the they wouldn't. Back to the subject though, the product has no mirror, no brush, no pretty pouch but it is practical and stable. It also click closes so wouldn't get loose easily. If you are not familiar to the design on the highlighter like me, don't worry. Here is a great post about it. The half circles are japanese traditional pattern which I remember seeing during my visit to Japan and the flower looks like an Origami one. During my childhood, I was very interested in Origami, this pattern brings back the memories. Upon posting photos at Instagram, I was also asked how this one compares to Guerlain Cruel Garden, which (surprise!) I don't own. At the same link though you can also see a comparison swatch. For this post, I took out some of the highlighters from my make-up warehouse dash museum out to play and here they are for your reference. I was mostly interested in how Guerlain Poudre de Soie would compare to Chanel Mouche de Beauté. You can see below that they are not remotely close. Chanel Mouche de Beauté is deeper and warmer. Chanel Dentelle Précieuse is also deeper and warmer, which I was expecting since that one never works on my as a highlighter. Armani Belladonna is much warmer. 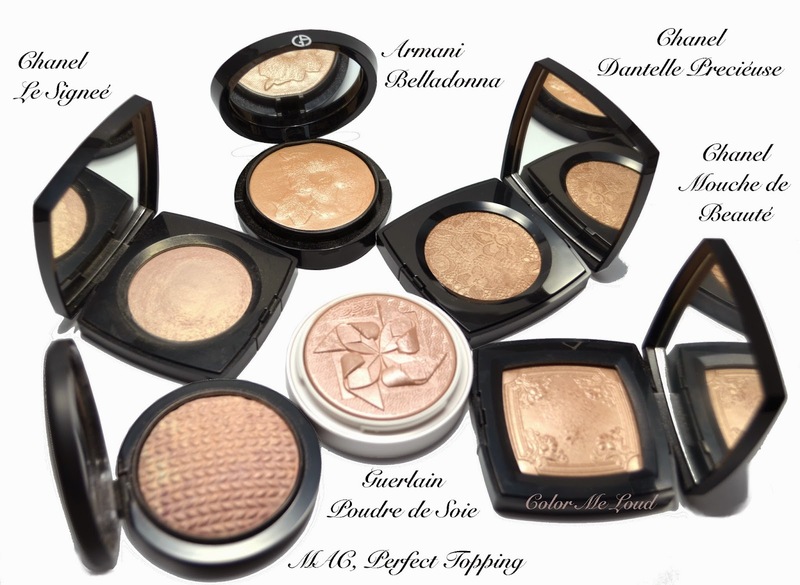 Chanel Poudre Signeé which is my favorite highlighter to date because I have given up the design and started using it bravely is a little warmer and subtler. Given the fact that my face eats highlighters and never shows them properly, that one sometimes is too subtle to be ever seen. MAC Mineralize Perfect Topping came the closest in my stash but I much prefer the texture of Guerlain Poudre de Soie to that one, because it is more visible, less frosty and more finely milled. If you find Chanel Poudre Signeé too subtle, Chanel Dentelle Précieuse rather dark and MAC Mineraliye Perfect Topping a little frosty, you should try to get hold of Guerlain Poudre de Soie. It has the right balance of coolness (not as cool as Cruel Gardenia but still cooler than many other highlighters), subtleness and shimmer. This one can also be worn as a highlighter with a denser brush or all over with a very soft brush. I used it with my Chikuhodo Z-9 for all over application and it looked lovely. No FOTDs in this post because it is hard to capture the effect. I plan to work on my portrait lighting once I survive tomorrow. Final thoughts: Guerlain Poudre De Soie Illuminating Powder Silk Shimmer is spot on for my complexion (NC20). It is not too cool nor too warm, very finale milled, not too shimmery and the lightness is just right as highlighter. If you happen to find it, don't miss it. Availability: Right now avaiable in Dubai and Asia although I have heard that in Asia it is mostly sold out. In UK Selfridges and Harrods are reported to have it in store but unfortunately they are not online. 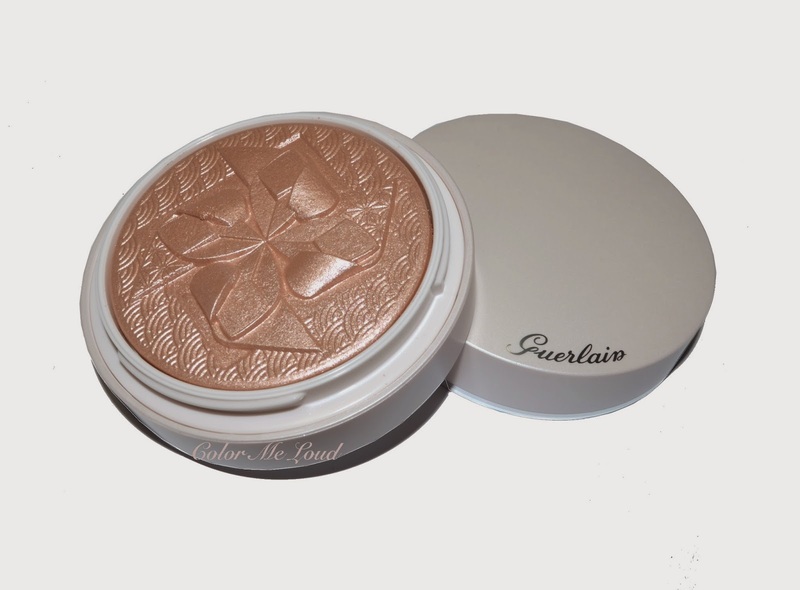 You might call them and make them send to you or wait for the summer releases because it is speculated that Guerlain Poudre De Soie Illuminating Powder Silk Shimmer will be released in the states in a few months. I don't have any information about availability in Germany but if I hear something, I will let you know. How I love this kind of posts! haha I love imagining your friend stalking the Guerlain counters in Dubai, that is priceless! and the part "If hijackers take over the plane, I might end up loosing my precious products which would kill me even if the they wouldn't" hilarious! 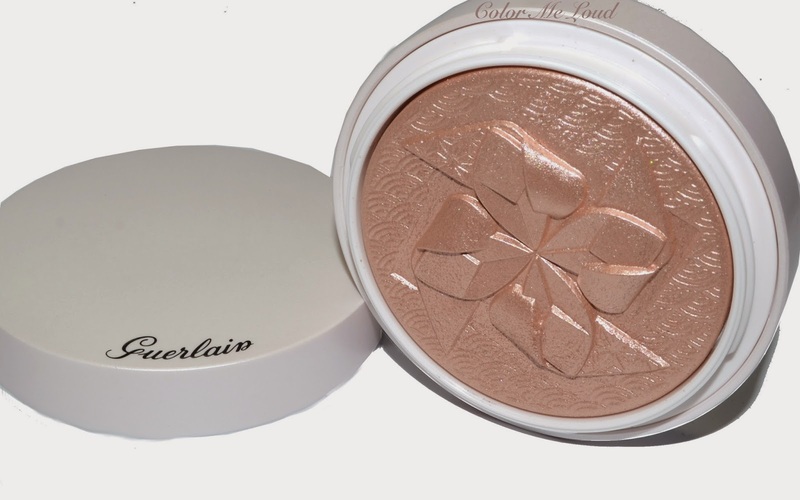 The highlighter is very very pretty, and seems great quality! Hi Sara, thanks for your comparison swatches. As I guessed, it is much too cool and frosty for me i think... but i'd LOVE to see a portrait! And good luck for today!!! there's something about a pretty highlighter that makes me so happy and this is no exception! How gorgeous! 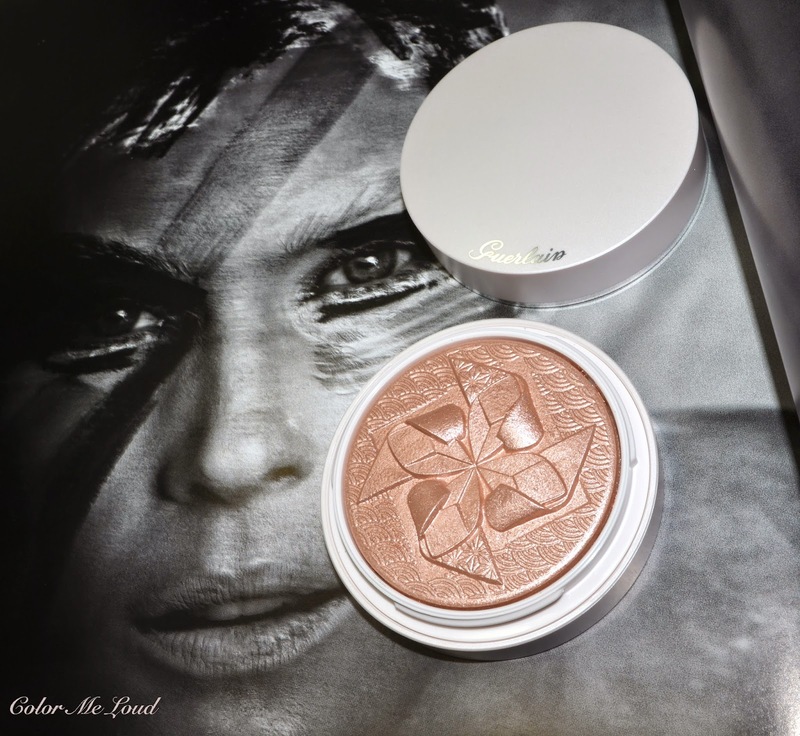 This is seriously one of the most beautiful highlighters ever! I would be a little scared to use it not to ruin the beautiful design! You're making me want to try mine but it's so pretty! It's now online at Selfridges too!